Part Used : Dried Marigold Flowers, Dried Marigold Petals, Leaves & Roots. Habitat : Cultivated in gardens in india. Uses : Calendula have been used to treat conjunctivitis, blepharitis, eczema, gastritis, minor burns including sunburns, warts, and minor injuries such as sprains and wounds. Calendula flowers have been considered beneficial in reducing inflammation, wound healing, and used as an antiseptic. Calendula has been used to treat a variety of skin diseases and has been seen effective in treatment of skin ulceration and eczema. If taken internally through a tea, it has been used for treatment of stomach ulcers, and inflammation. 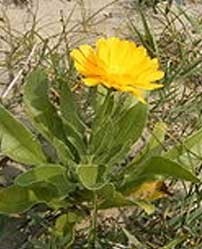 Calendula has been effective in treating juvenile acne and dry phthiriasis. It has also been used to treat cramps, coughs and snake bites. Research continues into the healing properties of Calendula. Calendula heals wounds as well as internal and external ulcers. It is an antiseptic, and improves blood flow to the affected area. As an antifungal agent, it can be used to treat athlete's foot, ringworm, and candida.